Oregon 2014 – Experience of a lifetime! A true Oregonian experience to savour sums up the two weeks I, Sam Waddington, spent on the Pacific Northwest of the USA this summer. From Saturday, 19 July to Sunday, August 3, with thanks to the organisation Mobility International USA (MIUSA), I found myself taking part in a variety of cultural activities. It really opened up my eyes to what can be achieved for disabled people. 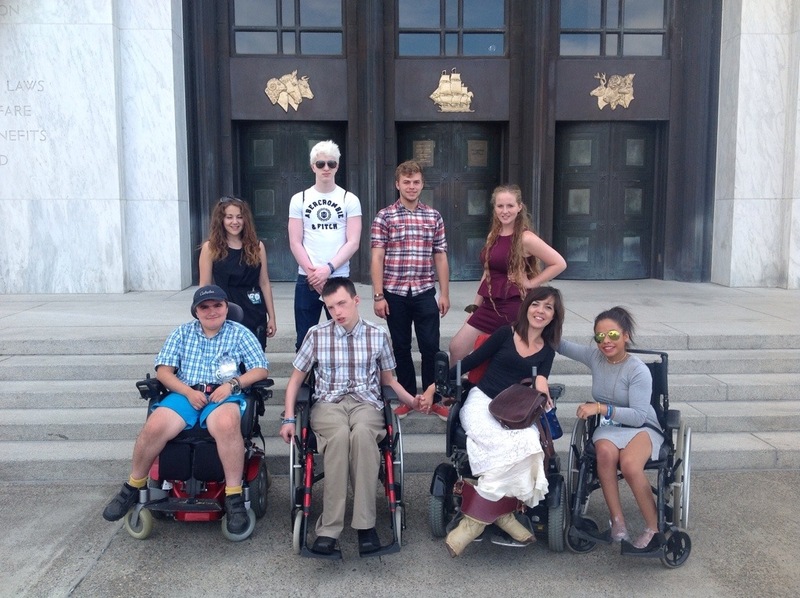 The disability empowerment focussed program brought a mixture of seven young disabled leaders from up and down the UK to Eugene, in the heart of Oregon. The state, famous for its spectacular views of woodland, was certainly the place to be on the fourth day of my trip. The Spencer Butte Outdoor Ropes Challenge was the activity, and no matter what all of us would be swinging 40 feet high in the air through the trees – just like Tarzan. With one release of the harness there I was screaming in sheer ecstasy as I experienced the best feeling of my life, supported and encouraged the whole way. Meeting up with various disability support organisations was the other aspect of this once in a lifetime opportunity. Early in the second week in Portland, Oregon’s largest city, we stopped off at ‘Incight’ to learn about how the company supported disabled people through education, employment and recreational activities. One of the ways was through a presentation given to local employers about a term that they have come up with, ‘Handicrap’ (a limiting belief, adopted as reality), which hopefully will allow the employers to look beyond the psychological barrier of disability. This term basically refers to the beliefs employers and disabled people themselves may have about the barriers to disability that are supposedly nonsense, ‘crap’! If you ever get the chance to come to this scenic state camping is a must. Two nights of the trip were spent in The Silver Falls State Park campsite, by day we hiked whilst witnessing stunning waterfall views and by night we made do with limited resources in our tents. The eating experiences on the comforting campfire really enhanced the outdoor element. Whether it was pushing wheelchairs through the roughest terrain possible or building the campfire, everyone chipped in, in a cross-cultural inclusive effort. A stay with a host family in the town of Eugene allowed me to experience a different culture. I was welcomed into a lovely family with a home that was completely accessible for my needs, with the busy schedule of the program I was given wholesome meals like Wild Alaskan Salmon and Spinach and Feta Cheese pie. The perfect opportunities to recuperate with the family in the evenings were provided. Being shown photos’ of their travels to the Redwood Trees in California or just discussing my life and culture whilst comparing it with theirs. On the second Saturday all of us had a free day with our host families to have a break from the tightly packed schedule. Not going to see the spectacular Pacific Coastline or the nearby lighthouse through the winding roads up the cliffs would have been bitterly disappointing. The highlight of the day was at the top of Cape Perpetula. From the sheer drop looking down on the preserved nature, with the sun shining upon both sea and woodland, will be a marvellous memory. USA’s 9th largest state is renowned for its inclusive attitude and effort towards disability. Riding through the public buses of Eugene with no accessibility issues emphasised this. It was not just the facilities though; the people felt a want to help disabled people rather than a need. The Hilyard Community Centre was a great place for encouraging ‘disabled’ support. It was so refreshing to hear the way staff spoke about being able to adapt any recreational activity. Either on a hand-controlled bike or trike, we all had a cycle in the glorious heat. At the end of the first week we all spent a day at the beautiful Clearwater Park beside Willamette River, running through Springfield, Oregon. Volunteering with a youth nature conservation team, The North West Youth Corps, was a great cross-cultural experience. Individually we worked with a member of the team to assist with chopping down branches and blackberry bushes along with cutting down grass and weeds. After a long day spent tirelessly working all the delegates were treated to a classic American hamburger in the woods. The American Embassy in London who funded the whole trip contacted MIUSA first about giving young leaders from the UK a fantastic platform to show what they are passionate about. The written application process for the program was thorough, each delegate was chosen because of their valuable work in promoting disability rights within their respective communities. Whether it was mobility issues, learning difficulties or visual and hearing impairments we all helped each other to gain the most from this social and cultural experience. Whenever I think of MIUSA now, the term ‘Exhaustive Inclusivity’ will come to mind. This is their general ethos for all the inbound and outbound programs with disabled people they run. Basically meaning if one person does not take part in an activity then no one will. Of course with the outstanding creative work ethic the team had, where there was a will there was a way. During camping the staff stood back letting us put up our own tents. How the organisation arranged such a wide array of activities in only a fortnight was a feat in itself. But, the behind the scenes work like the two hour American Road trips to get from A to B in all accessible vehicles was much appreciated. The staff also made sure all the hotels in Eugene and Portland along with the host family homes met our needs. All this meant the trip flowed smoothly. If the aim of the trip was to make disabled people feel empowered and independent then for me it certainly succeeded in achieving this. MIUSA will always have a special place in my heart.